This $180 scale gives you a "mini annual physical" every day, which is probably more than most people need. But it's really, really cool. I was fine with my dumb digital scale. It was cheap but highly rated and got the job done, flashing my weight at me once a day. It wasn’t Bluetooth or app-connected and didn’t track anything but pounds, but that was OK. What more could you want? 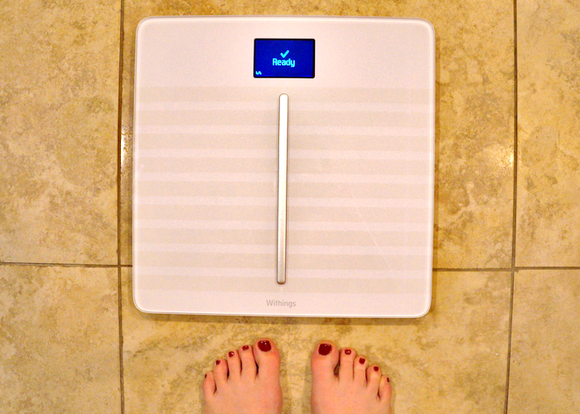 Then I started using a super smart Wi-Fi scale, the Withings WS–50 Smart Body Analyzer, and fell in love. Yes, in love. With a scale. It’s as stylish as a scale can possibly be, all glossy and black, and gave me more data than I knew what to do with—not just weight, but body fat percentage, heart rate, the weather forecast, and a rating of the air quality inside my house. If you think that sounds like overkill for a scale, wait until you see what Withings is doing now. The French tech company, recently acquired by Nokia, just launched the Body Cardio scale, which bypasses the Smart Body Analyzer’s functionality and goes straight to 100. Using this thing is like going to a doctor every morning, and I’m not sure I like it. First thing’s first: The $150 WS–50, introduced in 2013, is being phased out. Withings will no longer sell my favorite scale, introducing in its place two new devices: the $180 Body Cardio and the $130 Body. So what did Withings put in the Body Cardio to justify its price tag? Pulse wave velocity. My pulse wave velocity measurements are good! Now what? After you unbox the scale and turn it on using a small button on the righthand side, pair it with the Withings Health Mate app and connect it to your home Wi-Fi network. This is quick and easy. Then you have to calibrate the scale with five weigh-ins to see your pulse wave velocity measurement. You won’t see that measurement on the scale’s display, but the Health Mate app will chart it for you. The app will also tell you if your pulse wave velocity is normal for your age or whether you’re at risk for heart disease. Like your other metrics, like weight and heart rate, the Health Mate app will chart that data so you can view trends over time. It’s impossible to tell whether the pulse wave velocity measurement is accurate without a clinical test, which I didn’t have the opportunity to do. But Withings tested the device with a hypertension specialist in Paris who compared it to measurements from a sphygmometer, the accepted medical device for measuring pulse wave velocity. Based on readings from 111 individuals, the Body Cardio measurements and the sphygmometer measurements were “very close,” the Withings PR team told me. The results of those tests will be presented at the European Hypertension Symposium this month. I’ll be honest: The Body Cardio is probably more extreme than most people need. 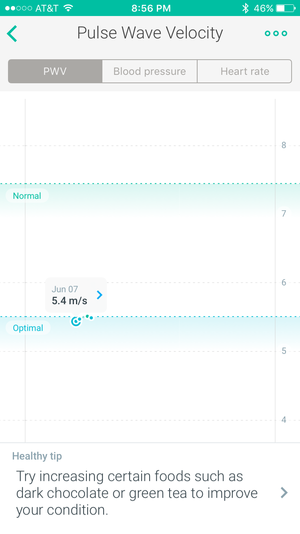 I’m not all that interested in getting a “mini annual physical every day,” as Withings is promising with this new high-tech scale. Just the one per year is fine. But I’m also a young, active person not particularly concerned about hypertension or diabetes. For those who need to be more vigilant and who are at risk for heart disease, the Body Cardio may be the weight management tool and heart health monitor they need. And I have to admit that seeing all those data points charted made my inner geek embarrassingly excited. Aside from the heart health measurements, the Body Cardio also tells you your BMI, bone mass, fat mass, muscle mass, body water percentage, heart rate, weather, and weight (obviously). For all its features, the scale isn’t FDA-certified as a medical device. If you have serious concerns about your health, you should visit a doctor and not try to diagnose or treat yourself at home. The Body Cardio might be too much scale for your needs, which is why Withings is also releasing the $130 Body. This scale is comparable to the WS–50, and it’s also $50 cheaper than its super intense sibling. The Body tells you BMI, body fat percentage, muscle mass, total body water percentage, the weather, and how much you weigh. Unlike the WS–50, it doesn’t measure air quality, but that’s not an essential feature, in my experience. (The Body Cardio doesn’t measure air quality, either.) I haven’t tested the Body yet, but if it’s anything like the WS–50, it might be your best bet for a smart scale. The Body Cardio scale is even slimmer than the Smart Body Analyzer and comes in a glossy bright white or midnight black. Basically, this is what a scale designed by Apple would look like, which is probably why Apple’s online store is one of the first places you can buy this new scale (along with the Withings website, of course). It’s also rechargeable and comes with a USB cable in the box, though you’ll almost never need to use it—the Body Cardio lasts for a year on a single charge. This Wi-Fi scale helps you manage your weight and keep an eye on your heart health with data and graphs galore, but its $180 price tag is steep for a scale.